Jode Designs: She wanted to be a 'Princess' mermaid..
She wanted to be a 'Princess' mermaid.. Since my daughter is getting a little bit older it is harder to choose a theme on my own :-) so for her 4th birthday party we had to do some compromising!! I really wanted to do a beach theme party as her birthday is in November which is great hot weather, perfect for the beach.. But she wanted a 'princess' theme (as all 4 year old girls love).. So we decided on a 'Mermaid Princess' theme.. Unfortunately we woke up to a very rainy day and ended up having the party at our house anyway (you cant predict these things!!) but never the less it was a good afternoon of food and fun!! I really wanted to do an invite where I could involve Imogen in the process so we decided on doing these white invites and together we spent the afternoon decorating them with a 'glittery' mermaid tail.. The colours we used were Aqua blue, Purple and Silver with a lot of glitter!! The place was decorated with signs, pom poms, shells, starfish, anchors and coral - all to fit into the 'beachy theme'.. I also used an old suitcase and put netting in it to place all the presents..
For the cake I did a 'Sandcastle' with a mermaid barbie at the front.. The cake was purple and aqua spounge cake and banana cake.. It was such an easy cake to make as perfection wasn't need with the icing!! Since it started to rain most of our 'fun beach games' went out the door but we still managed to amuse the kids!! They got to paint a ceramic creatures to take home, we played musical mermaids, limbo and went on a treasure hunt which we buried in the sand pit!! 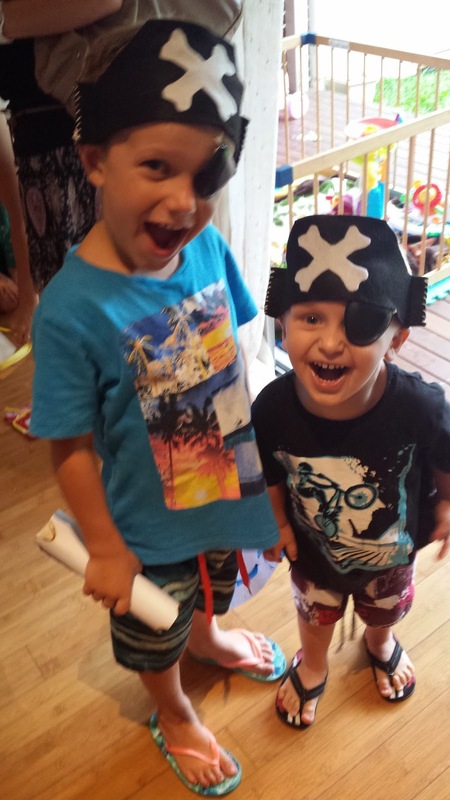 And it was full of lollies for them to take home..
For the goody bags each of the 'Mermaids' got mermaid tails and pearl necklaces and the 'Pirates' got pirate hats and a eye patch.. Imogen still dresses up in hers nearly everyday!!.. This little 'princess mermaid' was very tired after her big day..
Another one down - please stop growing!! Jodé Designs restores and creates gorgeous baby furniture, furniture and homewares for you to purchase at very reasonable prices. The director of Jodé Designs, Jodi, is an Interior Designer, a wife to a plumber and a mother to a cute little girl named Imogen Hope and a handsome little boy named Zion Hezekiah. While pregnant with Imogen, Jodi found a gap in the market of baby furniture. So with her artistic mind and years of experience Jodi created Jodé Designs. With an overwhelming response to her products, Jodi extended her range to furniture and homewares.. Please enjoy..
New Stock to keep you going over the weekend!! Think outside the square.. Stylish wardrobe.. Think outside the square.. Modern mirrors.. Think outside the square.. Beautiful bookcases..
DIY Week - Ideas for Ikea..
DIY Week.. No sewing required..
DIY Week.. What to do with wood..
DIY Week.. Make a light that sets a mood..
DIY Week.. Being creative with concrete.. Mothers Day.. Oh the places we will go.. Mothers Day - A gift made with love.. Mothers Day.. A sleep-in, then breakfast in bed!! Mothers Day - Give her a card with personality!! French blue piano/dresser stool mood board.. Restored Wooden Rocking Horse Mood Board..
Retro.. Vintage.. Industrial.. more stock..
Cow Hide Rug Mood Board..
Grey Wooden Coffee Table Mood Board.. Smash Cake - Party for one!! White wooden round table mood board.. Antique Doctors Bag Mood Board..